With the club confirming that only the boys U14s are playing at home on the 10th (and our U14s training), we seem to be clear to host the tournament that was cancelled last Sunday. Obviously with barely a week to put anything in place - and indeed with the rest of the junior club elsewhere - its going to be a big ask. There is also the minis Christmas party at 4 o'clock - but we'll aim to be finished by then (that or we'll be under floodlights). Clearly ANY help anyone can provide will be appreciated. Not sure what RFUW will want from us in practice - they are asking other clubs about referees. But we did this for the Sevens so we know what works - and there'll be rather fewer girls this time. In fact if you think about it, its not much bigger than a standard triangualar as there will be no U14s - and they have always gone off well enough. Out of the blue Samantha Theobold-Roe has just been invited to play for East Midlands U14s in Newark on Sunday in the same tournament Fern will be playing. This gives us a remarkly high hit-rate for county selection from our Beds-based players - ie. 100%! In Samantha's case, though, she did not even have to attend trials. It seems word spreads and someone somewhere has spotted her, and when they found out where she played an invitation was quickly sent. It also means that though our U14 section is small, nearly half of them will have played for their counties. Overall it takes our county selections up to 12 - nine for Hertfordshire, two for East Midlands, and one for Eastern Counties. Plus several Herts Barbarians, including the captain. Due to the cancellation of U17 Herts Barbarian training tomorrow, we will now have enough numbers to make training at Letchworth worthwhile. Can you all please bring a change of clothes or tracksuits to put over any muddy areas as part of the session maybe indoors. Lets get a really good turnout turn our attention to beating welwyn and get this season back on track. The U17 county squad should still travel to Welwyn for 6.30 as alternative training arrangements are being put in place. The U17 Barbarians will no longer have any training. More county success as Fern gets the call from East Mids! Great news of yet another county call-up - Fern has been selected by new East Midlands "County" team! This is the first time that there has been East Midlands county team. A bit like Sasha's "Eastern Counties" it is a combined area (taking in - in this case - Bedfordshire & Northamptonshire) and not to be confused by the East Midlands Region which also includes Leicestershire, Nottinghamshire, and Lincolnshire. Fern will be making her county debut in a game against Leicestershire on Sunday. I gather that as East Mids have been a bit slow gettig going they've withdawn from the tournament in Essex as they felt they weren't ready for it. Due to the tour our away game at Kettering in April has been moved to Sunday January 7th - that's the first weekend back after Christmas and gives us games every weekend right through the month up to regional trials. One great thing about the change is that the fixture will now be "triangular" and will give us the chance to play against Buxton from Derbyshire - a team we would never normally get to meet - which will make the trip up to Northants well worth the effort! Also there is a chance that we might get to host a Canadian school team from Lindsay, Ontario who are due to be on tour here over Easter. I'm currently in correspondence with them but the idea would be that we'd give them a warm-up game at the start of their tour (ie. the week before we go away to Devon - possibly on a midweek afternoon) after which they would go on to play Hertfordshire and Essex/Eastern Counties. Needless to say its not as simple as all that by any means - but in the meanwhile does know the Candian National Anthem? With the U17s National Cup called off... at ten to 11 on Sunday morning (!) it was up to the U14s to go for glory. Mind you at least we hadn't left for Saracens - I dread to think what Worthing had to say when they heard... chances are they'd already been on the road for a couple of hours! Still, our Sudbury colleagues managed to get some Christmas shopping in instead, as I gather they got the news while passing a big shopping centre in Braintree. For some reason they felt that a little retail therapy was preferable to a session in mud at Letchworth and politely declined to join us. And no - I have no idea what happens next there being not that many free dates to rearrange before the next round in February. On the subject of which - the U14s. Well, Samantha and Laura anyway who joined girls from Saracens and and various points to the east (Diss, Ely, etc.) to form "Hertfordshire Barbarians". With Uttlesford pulling out it was two to go through from three, and when the "Barbarians" began with a 5-0 win over Welwyn they were soon on their way. Sam and Laura then guested for Cramberly (coached by Dean Richards... ask a parent who he was!) who comprehensively beat Welwyn 17-0, despite having fewer players - Sam particularly impressing Simon Shutler, the Barbarians (and Herts county) coach. So when to came to the final game both teams were actually already through - but it was a terrific game, despite being played on a now glutinous surface and finishing very nearly in the dark. Sam and Laura actually chose to stay with the Surrey team as the result didn't matter, and the Barbarians won 10-5. Tackle safety - an event of some relevence? A remarkably well-timed evening is coming up in the next few weeks. Given the fairly large injury list built up over the past two games, I hope that many of you may be interested in a evening on "Tackle safety and coaching contact" being run at the club on Monday 11th December (6.30 to 9.00). Although aimed at coaches, Phil Waters - Letchworth's coaching co-ordinator - has made it clear that he will welcome "all coaches/assistants/budding parent-coaches", so that is pretty much anyone interested in coaching or helping out in any way. Also as its not a formal coaching award course there also won't be a minimum age, so I reckon anyone from the U17s at least could usefully attend, whether or not you are 16 yet. Even if you don't ever want to become a full coach, being able to help take new girls through the basics of tackling would be very valuable. It might also help you spot poor technique among teammates, and do something about it, before they injure someone or injure themselves. Let me or Phil know if you might be able to come along so that we have an idea about numbers. 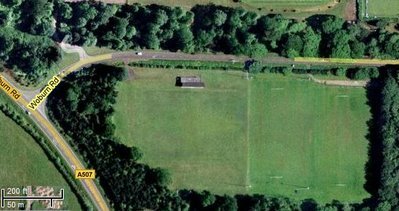 National Cup competition matches this Sunday away at the old Saracens ground in Southgate, directions posted below somewhere. Meet time is now 11:20. Please let me know if you cannot make it!!! "Start Rugby" - and help develop the girls teams! The club will be hosting a "Start Rugby" course on the evening of 15th January. This is a new course aimed at anyone interested in helping to coach or introduce new players to the game, but perhaps not interested or able to commit to become a fully qualified coach at this stage. As such its ideal for any parents or players who want to get more involved in helping the game - and girls' section - develop and grow. The course takes just one evening, is apparently quite active and hands on, and at the end of it you take away not only the experience but a big pack of drills and games for groups of all sizes. The fees will be paid by the club. There may be a minimum age, but at this stage I am not sure what that would be - so let me know if you are interested anyway. There is also a "tag" rugby traning course coming up at Royston RFC on 12th February, and sessions on "tackle safety & coaching contact" at Letchworth on 11th December and Stevenage on 19th March. Again if these sound interesting let me know. Anyway if you are in the scouts you might try to excite a bit of interest - especially among any other girls. Also so far only units in Letchworth & Baldock district who have been invited - but there is no reason why troops from other districts might not also enter. If you go to scouts outside the district, see if they are interested as well and let me know. Similarly if you are in the Guides there is no reason why they should not take part - I'll be writing to the local ADC shortly, but in the meanwhile let your group know. And before anyone asks the afternoon will be FREE! While everyone else was floundering around in the mud last night, our county U17 girls were having a training session with a difference - the warm and dry where they met and listened to Margaret Alphonsi - Saracens and England's No7*. Margaret is currently studying for her Masters in Sports Psychology, and is also Rugby Development Officer for Saracens (Amateur )RFC, as well as fitting in training on 5 days each week. She was there to talk about the importance of goal setting and sports psychology, showing the county squad how they could raise their game as individuals and as a team. Next Wednesday there will not only be training at Welwyn for U17 county squad (from 6.30) but also training for the U17 Barbarian squad. As a result there will hardly be any U17s left so we may well not have any trainnig at Letchworth that evening. We want to encourage as many of you as possible to play in the Barbarian side - not only because Emily is captain, but because the tournament on the 3rd in Westcliff sounds like it'll be a huge event which you will also benefit from being a part of. However, if you don't want to go AND you do want to train next week PLEASE let me know before Sunday. After all its not worth Joe and Mike coming over to training if they are going to outnumber the players! On January 21st we will be hosting Market Harborough in addition to Kettering. Okay, the last two are hardly unusual. Or indeed the first two come to that! Anyway - they have about seven U14s and a similar number of U17s, so one way or another it means we'll get close to full games regardless of the numbers Kettering bring. With a number of other events occuring we travelled to Amtill on Sunday with just 13 of our 24 girls. With the unusuak numbers came an unusual set of positions with both sides agreeing to play with 8 in the back line (1more than a full backline). The girls started well and adapted to the conditions early. They were organised both in attack and defence and applied pressure to Ampthill from the start. This paid off as Nim forced through tackle after tackle to put the L egends ahead. Unfortunately with some plonker holding the ball up she was unable to convert. Nattalie, returning to pobably her prefered position on the wing, started as she went on. Several early breaks lead to nothing however her persistance was rewarded and she crossed to increase the score. Again with the ball being proped up the conversion was missed. Letchworth continuing to dominate crossed the line twice more in the first half, however only the first was awarded. Jess made a break down the left wing, outpaceing all the trailing defenders and managing to touch down under the posts. With the Kicking tee now being used Nim slotted the conversion. The second line crossing came from Randy who managed to cross two lines and still not score. After crossing the first line (try line) tryed to make her way to touch down under the posts. She was unsuccessful in her attempts as she was bundled over the second line (dead ball line) and missed out on a well deserved try. The first half ended with injuries. First nattalie who would later return to the game but also Nim. Suffering pain in her shoulder after landing aqwardly and ending her game. At some point in the first half Ampthill scored but cant remember when or how so the girls went in 17-5 at half time. With further injuries Letchworth were left playing with 10 and conceded early in the 2nd half. However the girls stuck at it and there efforts were rewarded. Nikki crossed to add the girls 4th try of the day and Jess taking over kicking duties converted from infront of the posts to make it 24-10. And thats how the score remained. Player of the day went to Nattalie who consistantly created problems on her wing and was always asking questions of her opposite number. Special mention must go to Jess Rayner who, in only playing her second match, played absolutely outstandingly. Solid in both attack and defence and was unlucky to not go home with a try. Barbarians "a credit to the club"
That was the message I was given yesterday evening about the Letchworth girls who went to Barbarian training the Sunday before last, from Clive the coach (who will also be the lead coach at region - so is not easily impressed!). 2. c) Mel. Yes - when you are injured and can't walk or find yourself having to get up at an absurd time on a Sunday morning blame Mel Hobbs. It was her wanting to have a go at playing rugby that started all this off... because I couldn't find her a team. 3. Hayley, Nichola, Mel, and Katie. Not Carla as several incorrectly guessed. 5. d) Huge win - something like 47-12, and amazingly still our biggest ever win! The tries against us were also scored by loaned Letchworth players! 6. b) Nikki... by miles. 7. c) The much missed Ruby Sharp, who scored seven against Cheshunt at Chesunt in the first Herts Sevens. 8. e) Five. Looked like the casualty clearing station after a major battle - bandages everywhere. 9. c) Nichola. Amazingly enough. 10. Ampthill. But now that has been put right! I'll do it again with some more contemporary questions later on. Depart c12.00, arrive 12.30, kick-off 1.30. Tournament due to end c3.30. Four teams (Letchworth + Saracens + E Counties ("Hertfordshire Barbarians"); Welwyn, Uttlesford and Cramberleigh) will play each other in a round-robin group. The top two teams will qualify for the next round in February. Games will be 12 minutes each way. There will be a draw at 12.45 to decide who plays when. Getting there: Most people will have been to Welwyn - but if you have not, exit the A1(M) at Juntion 4 and follow the A6129 towards Welwyn. The check out this map. Depart c11.30, arrive 12.30, kick-off 1.30. Tournament due to end c4.30. Six teams to be divided into two pools of three - draw at 12.45. Winner of each pool will qualify for the next round. Games 20 minutes each way. Getting there: Bramley Sports Ground, Green Road, Southgate, London N14. M25 west to Junction 24, then A111 south for 2-3 miles. Just after the road crosses the A110, Saracens's ground will be found on the left. See map. On the 14th December any girls who play rugby in Hertfordshire are invited to attend a training session with the Saracens women players, including England players Maggie Alphonsi and Karen Andrew, at the Saracens RFC, Bramley Rd, Southgate. Training will be from 7.30pm to 9pm. Afterwards there will be a free hot meal for all players, (adults may buy it for £1 a go), the bar will be open, and there will be photos taken with the Saracens women (which will be better organised than the session with the men's team!). The event will finish at 10pm. For the photos we will need the county girls in their drill tops or county kit, which will highlight both giels rugby generally and the Saracens themselves. If you can attend please let us know as soon as possible - by Friday 1st December at the latest. The Threlfall Family album has been expanded again to include some exvellent pictures from Sunday's game (<http://www.flickr.com/photos/phil_t_photos/>). However Natalie's dad apologies for them appearing in reverse order ("I loaded them backwards!?")! Steph, Katie and Nim are all now Level 1 coaches following their courses in September. Is anyone else interested? You have to be at least 16 on the date of the course - but even if you aren't yet think about it and let me know. The game is desparately short of female coaches so we can get all sorts of grants to cover the cost (ie, you won't have to pay a penny), it will teach you more about the game - which will improve how you play - and it may well come in useful in the future, be it GCSE PE courses, or even earning a few pennies doing coaching in the summer months. Plus you can help prepare the next generation of Letchworth girls. If that seems a big step there are also some one-evening courses coming up at Letchworth covering the coaching of tag rugby, plus a new "Start Rugby" course which covers some basic skills for introducing the game to new players. In fact the "Start Rugby" course is recommended for parents as well - more details about both shortly. Only one week to go before possibly our biggest test ever at U17, and an interesting day for the U14s as well. What is more the first time ever that the two age groups have had fixtures at different places on the same day. For what its worth I think both teams have a good chance of making it to the next stage. Honestly. The U14s have already shown that Welwyn are no invincible, and in combination with Saracens should prove a match for all three of their opponents, and on paper a combined Letchworth/Sudbury team - even without Hayley - looks pretty tasty. After all the U17s showed their strength in depth today at Ampthill. To go from 24 girls "on the books" only 13 for a game is bad enough (4 injuries, 3 scout campers, two "unavailables" [and a partridge in a pear tree..?]). But to lose in that all three of our players from last years U17 regionals, plus our single most experienced player and fly half, could have been a blow that would sink some teams - but those that were left completed the job in a professional manner. Gaps were filled, people stepped up to the plate and took the responsibility they needed to do. The loss of Nim near the end of the first half, then Emily after that, shook things up for a period - without that the margin of victory (24-10) would have been far bigger - but shape was regained and the team held together for a result that was never really in doubt. Hopefully Joe will do a more detailed review later, but well done everyone. With that experience next weekend I suspect Joe and the Sudbury coach are going to have some difficult decisions, not least because the total squad size is limited to 25. Its inevitable that some people will be disappointed, but it is rare we have to make selection decisions like this. Most of the time our aim is to give as much game time to as many of you as possible - participation comes first. But next weekend is different - its all about the result. Experience will be what counts - and if you miss out this time, then battle to make sure you make it next time. See you all Wednesday... always assuming we can get to the ground in between the roadworks! A reminder of the game this weekend. Meet at the club at 12:00 to depart by 12:15. Kick Off is at 2:00 and as usual Match Shirt will be in the changing rooms when you get changed. Match Day Dress code must be worn by all. Please let me know if you're not available or need a lift. A league of our own? So the question of whether we should have one in East has come up, and will be discussed in January. Ideas for models and structures have been requested and so I thought I'd let everyone see what I am likely to propose, so that you can all comment on it. Essentially the idea is that all games should be full-sized matches, and to ensur ethis could happen clubs would be combined into "clusters" unless they had squads big enough to stand alone. One result of this would be that any girl, regardless of how many players there were at her club, would be guaranteed a place in a "cluster" team without having to move to a different club (which is what would happen if a league were based on just club teams). Anyway - the full proposal is here - comments welcome. 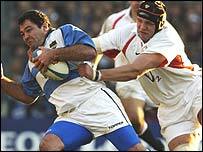 ... that every U17 not in the county squad make themselves available for the Barbarians at Westcliff on 3rd December. Apparently the turnout for the Herts Barbarians was a shade disappointing on Sunday, but they do now have a captain - Emily. Last year the "B" team beat a full strength Oxfordshire side and was awarded the region's "county team of the year" title as a result. Several Letchworth girls made that happen - including Mel who scored the try that turned the game, and Sasha who... played her usual game. Next month it'll be time to do it again. Should be an interesting day as Letchworth girls could appear in as many as four of the eight teams, if Fern gets into the East Midlands squad. Small matter of Ampthill, and then the National Cup first of course. Ampthill... this time let's finish it! Its the game that at least one person has been waiting for. Yes its Ampthill, Fern's old club, so that adds a bit of spice. Not that it needs it really as at U17 level we have a curious history. They visited us last year and we fought out a titantic 0-0 draw, the game ending early in the second half due to an Ampthill injury. A few months later in Wimbledon the Hertfordshire Sevens team (mainly Letchworth) played Bedfordshire (mainly Ampthill). Result? A 0-0 draw, the game ending early in the second half due to a Bedfordshire injury - actually a girl from Surrey who had been lent to them, but you get the drift. Basically the two teams have played against each other for a total of at least 40 minutes so far, no-one's scored - indeed if I recall no-one's come close to scoring - but we've put two of their players in hospital. In practice the shape of our teams have changed rather significantly. We now have a full backline, and Ampthill have lost several of their best players 'cause they are now too old. They have some promising youngsters coming in at the bottom though. So we can be reasonably confident that someone will score this time, lets aim to finish the game, but mainly its about winning it for Fern! Distance: About 18 miles. Journey time: 30 to 45 minutes. Note that we are advised not to arrive too early as there is a big minis triangular competition in the morning so if you arrive much before 1pm you may not have anywhere to park! At Ampthill stay on the the bypass (A507 ) towards Ridgemont. Past the industrial estate (on the left), take the right turn for Ampthill (B530, Woburn Road leading to Woburn St.). Ampthill Park is almost immediately on the left, with the Rugby Club on the Right. We have arranged an extra game for you to make up for missing out on a match this weekend (as Ampthill have no U14s). Unfortunately we haven't been able to swing anything for this weekend but on 17th December you will be visiting Hertford RFC. They have lots of U14s apparently, but all very new this year (we beat them at Rochford) so should be a good day which everyone can take part in, regardless of you experience. They will hopefully visit us in return on 25th March when we will also have Saracens and Milton Keynes U14s - so a small tournament! As you know Nim Parnell from the U17s will be working with you on the next few Wednesdays. This week she'll be starting to get you ready for Sunday 26th when you'll be combining with Saracens (and a few girls from Eastern Counties) to take part in the National Cup qualifiying competition at Welwyn. Eight of our girls took the long drive to the middle of Oxfordshire (or "no-where" as someone in the back seat of may car described it) on Sunday, and all played their part in a massive triumph for the county. At U14 level Hayley and Laura played hard on their county debuts as Herts won all three games against Oxfordshire (22-0), Essex (5-0) and Middlesex (15-0). Laura actually played for three counties on the day - "guesting" for Oxfordshire and Essex before pulling on the light green for the first time. The u17s had two games - against Oxfordshire (won 40+-nil) and Essex (won 15-0). Six of our seven U17 squad members took part - only Steph's hand injury keeping her away. Katie played one half against each side - coping well with some "gamesmanship" (ie. blatant cheating!) from the Essex scrum-half who at times was sneeking round the back of the referee and ending up nearer the Herts front row than Katie was! Hayley - held back from playing against Oxfordshire - made up for it with a great performance in the second game, including a typical crash-through-everyone try from about 10m out, and might have had another one had she not been listening to the siren call of a team-mate calling for a pass ... which she failed to catch! Both Herts teams looked scarily good - how good we will see on 3rd December. 1. Who is the only current player who had played girls' rugby BEFORE Letchworth Girls' was formed? 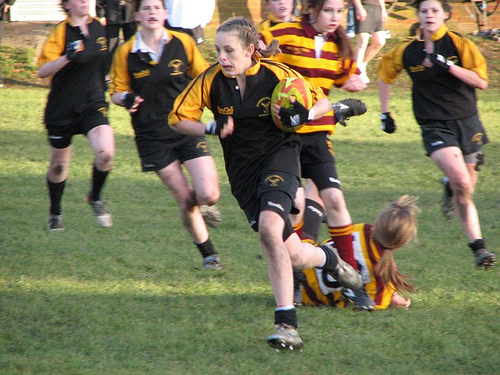 2. Who started the ball rolling that lead to the creation of the girls' section by asking where she could play rugby? 3. Six girls from Letchworth were part of the first North Herts girls rugby team at Youth Games in 2004 and four of those girls still play - who are these four "founder members"? 4. Three of those six went on to play for the regional team that winter... so where did that star-studdied North Herts team finish in the 2004 Youth Games? 5. Milton Keynes were the first opponents... what was the result? 6. Who has played the most games? 7. Who has scored the most tries in one game (seven)? 8. We took an U14 and U17 team to the National Sevens in 2005. How many U14s were injured by the end of their first game? 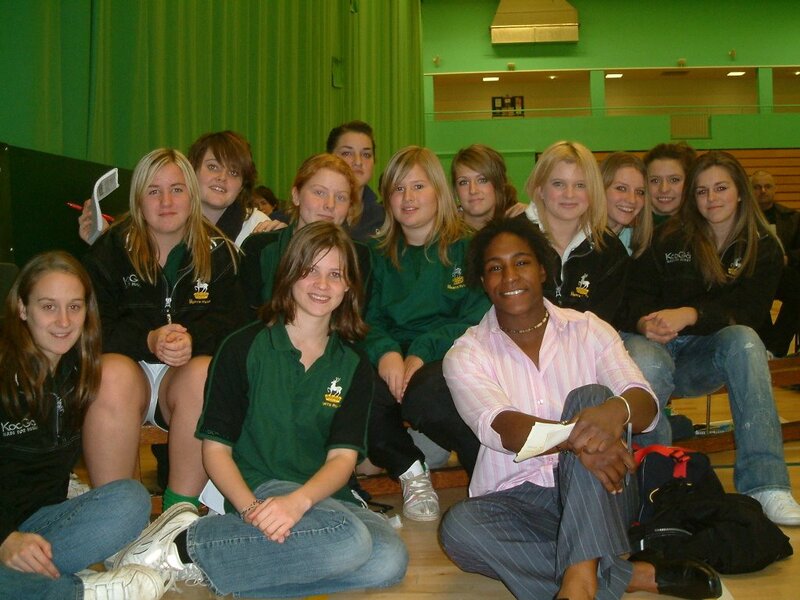 9. Who has not only played regional rugby, but also district netball and county cricket? 10. Only one match has ever finished 0-0. Who were the opponents? Sorry for the delay but here is Sundays match Report. With what can only be described as the best training session we've had this season in the build up during the week, the girls arrived on Sunday morning full of optimism and took a very profesional attitude to their preperation and warm up. Congratulations to Sasha for making the "TDG" - the select group of 30 U17s chosen from across the country for a series of special training sessions over the rest of the season. No real surprise I guess - but the shock is that Hayley missed out this time (though she will have another chance next year - and indeed the year after). Anyway - good luck Sasha! The draw for the National Cup on 26th November has been announced. The U17s are in the South East group and the good news is that we don't have to go far - Saracens (Bramley Road Club House, Green Road, Southgate N14 4AB) in fact. And who are we up against? The less good news is that the U17s probably be without Hayley, Nichola and Carla that weekend as they are due to be in Somerset with the Scouts. In both cases teams have to register at 12.30 for a 1.30 kick-off. In the end it was a very close game - perhaps our policy of rolling players on and off in order to give everyone game time disrupted the "shape" of the team which might have made the difference? Who knows - but the most important thing in this club is that everyone who is available to play can play. Participation comes first - especially in "friendly" fixtures like this - and long may it remain so. Its the experience that matters - you'll remember taking part in games like this - this tackle, that run - long after the result has been forgotten. But before ending on today I must say a big "thank you" to those U17s who helped out with the U14s early on. Its getting very tough to get U14 games at the minute (though we've hopefully got at least one extra game for them line up for next month - just waiting final confirmation) so any playing experience they can get is important, especially with county etc. next week. And for the rest ... a weekend off (!?). Hmmmmm... Perhaps Joe can come up with some personal fitness drills for anyone planning to relax at home next Sunday? A reminder of the game tomorrow versus a combined Sudbury/Ely side. I don't think I need to say how importnat this game is!!!!! U17s are required to arrive in our dress code and be outside the clubhouse by 12:30. The game will be kicking off at approx 2:00pm. Any questions or if you are not available please email me. Ticket prices are £40 adult and £20 children and the seats are in the East Stand. Tickets will be issued on a strictly first come, first served basis from David Roberts. Apply quickly because they probably won't last long!